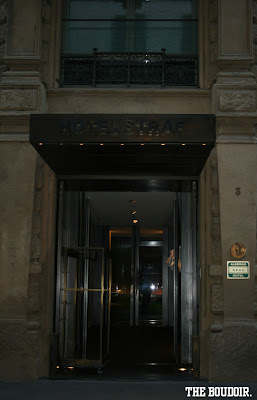 The second hotel I stayed in was Hotel Straf, a hotel that was number one on my list if I ever visited Milan, Italy. The best location, even closer than Rosa Grand, its door facing the famous department store La Rinascente and exactly by the Duomo Cathedral. 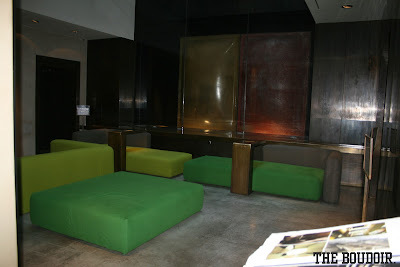 An extremely trendy modern design boutique hotel and its a member of the Design Hotels. I am surprised that its a 4-star hotel, it felt like it was 5-stars. 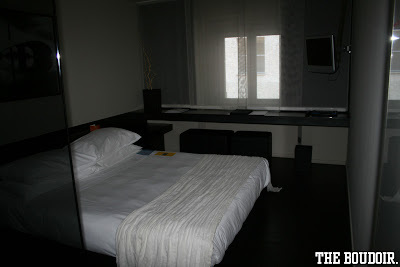 I loved the room, which I have chosen carefully, called the Well Being room. A room fitted with a Japanese massage armchair, complete wih aroma and cromotherapy. 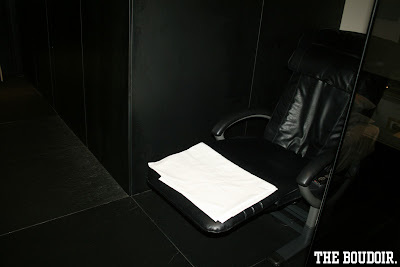 The massage chair is seperated from the bedroom by a glass wall and door. When you're in the chair you can dim the lights and use the relaxing blue tiny star-like lighting. You can choose the aroma and enjoy your massage. Perfection. 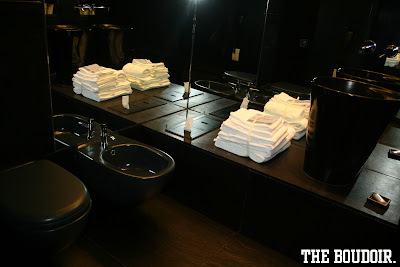 The pitch black bathroom is a piece or art which you can see from the picture. The service was excellent couldn't have asked for better service. 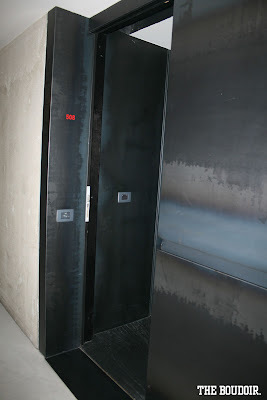 I recommend this hotel to design lovers and the trendy. Definitely not suited for children and people not accustomed to the unique different use of things especially the bathroom where you have to reach down to the extremely low sink. I didn't enjoy the modernized hotels when I visited Italy the last time :s I enjoyed more the Hotel Boutiques we stayed at outside of Rome. I felt that Rome and Milan should retain that classic touch you find in European Hotels. I'm going to Milan this summer but I can't seem to decide on which hotel to choose! I recommend Park hyatt milano..excellent location..beautiful hotel! Theres also "The Grey" hotel its exactly opposite Straf Hotel..further away good but expensive hotels are Four Seasons and Bulgari..but I think Park Hyatt would be great. I am really interested to go on that hotel after I read this post. I will have to add this to my list of places to go next year. Thanks for sharing!